If you just simply are diving into innovations with no alignment structure you risk growing disappointments. In setting about having a series of strategic conversation of where innovation ‘fits’ can change the goalposts, alter the perspective and can give the innovation a more focused framing to build far better value propositions around. Constructing an innovation conversation framework is never easy, we all come at it in different ways and those strategic conversations can begin to fray at the edges and slip more into tactical, the more we talk and this needs to be watched! 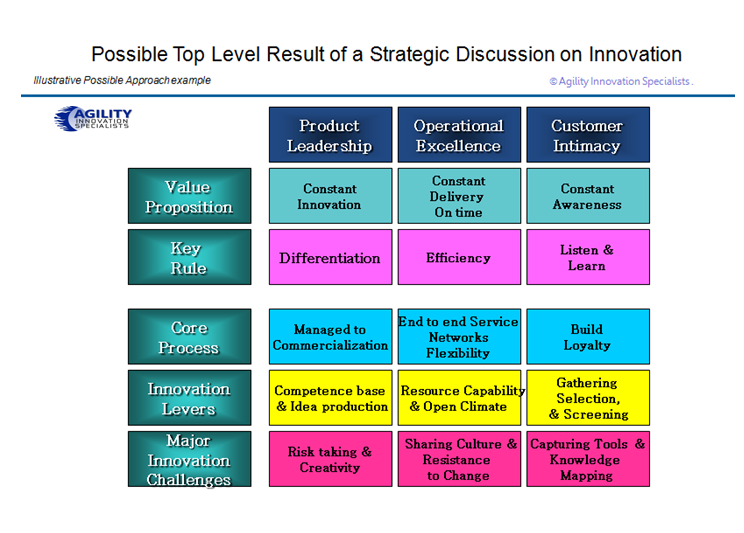 One where we can approach different strategic value propositions, and where we might need to debate these across the organization, as the points of impact and resource need, so we can make a move towards a higher degree of innovation alignment from all involved. If we take just the three ‘classic’ strategic thrusts of product leadership, operational excellence or customer intimacy, then we need to make clear the potentially different emphasis points within any suggested innovation approach that we should take. We must, within any innovation approach, be clear on what and where we should be placing our primary focus. This framing can be most useful to remind people who are involved that there are significant points of difference depending on the route approach to market. There is a need to agree and align on what we are driving towards – and support any selected strategic direction. This framework can really open up the discussion. It can begin to show the possible implications and challenges ahead. I would really doubt you could achieve a combination of all three, if you just consider some of the aspects I’ve laid out within this framework above. If it is still demanded, and some leaders can be just that, demanding – wanting to cover all the bases without knowing why they should be really focusing down on one of these. The direction you go requires the organizational focus to build the type of capabilities, resources and processes to match this and these are critically different, dependant on the approach you take. I would suggest you really do need, even more, a framework to remind you of the critical differences and what aspects need clear focus to deliver to the distinct value proposition parts. Each strategic value proposition has significant implications to plan and work through. This framework can help you to contribute to achieving a greater alignment between the strategic direction (product leadership, operational excellence or customer intimacy) and the key innovation aspects that help to align to this which the organization will need to think about and work through. This entry was posted in Uncategorized and tagged a framework for leading innovation, alignment of innovation and strategy, common innovation framework, common understanding of innovation, designed conversations for innovation, identity with strategic goals and innovation alignment, Innovation Structure, strategic conversation framework, strategic discussion and innovation alignment. Bookmark the permalink.